I planted those mums yesterday and in the midst of cursing through sweat and sniffles I found that their happy little faces made me smile. I'm not a big gardener - one of those traits I didn't get from my mom. My parents' yard is about a third of an acre and even now, they work all the landscaping with their own 2 (4) hands. I'd like to pretend my thumb is green, but it is far from. So those chrysanthemums are a little bit on their own! She's getting to be a big girl, huh? We're planning a First birthday party for her in May. What? You really think I wouldn't throw a birthday party for my dog? Come now... Honestly though, it's a great excuse to get some friends together to eat hot dogs and cupcakes with dog shapes piped in frosting. I'm looking forward to it. But I can't believe our little baby puppy who weighed 7 pounds the night we brought her home, is pushing low-60's and turning one. Where does time go? Another birthday that's come around again was that of my good friend, Liz. Remember my macarons and knitted purses obsession and our fantastic trip to Napa? Really... WHERE DOES THE TIME GO? We celebrated Liz's birthday this past weekend again; and again I took to making gifts by hand... I made her a 4" personal sized Concorde (don't worry, there was one to share with the group as well) and - an apron! Now, Liz doesn't cook or bake or even spend much time in the kitchen. But she'd like to. So I thought perhaps she'd be more inclined with a cute apron made by moi - for moral support! Not a complicated thing to make up, but make it up I did. I thought it turned out rather cute. And really, the hardest part was finding fabrics and trim that complemented each other - sewing and cutting was all straight lines. Happy Spring and Happy Week! I love the apron, it's great and the colors look wonderful together. Handmade gifts are the best! Thanks so much for the beautiful apron, Lise!! 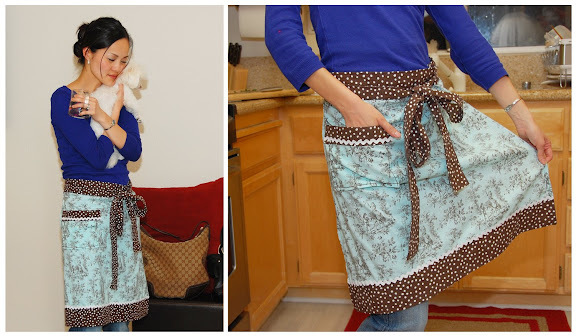 You have been an inspiration for me to be a better cook and maybe even a baker but now, I have no excuses..I get to wear the something so cute (while cooking)! =) I really appreciate it so much!! I am ready for warmer weather and that is one cute doggie!! !